Yes, the racing season is already upon us. This isn't the road cycling racing season, though. While most cycling teams, say McKinney Velo, are off at exotic locales engaging in spirited training camps, the multisport racing season has begun. Of course, it may not be the multisport that most people think of, that being triathlon. It's still a little chilly to be taking a dip in the water, so we stick to dry land. This is the season of the duathlon. For those not familiar, the sport involves running and cycling with either a format of run-bike-run or run-bike-run-bike-run. Distances of the three-leg races aren't predictable as they are dependent on the available course real estate. Five-leg races are usually referred to as "F1" duathlons and consist of three 2-mile run stages with two 10-mile bike stages mixed in. Competing in duathlons has taken me to a variety of venues, including Texas Motor Speedway, Joe Pool Lake park, The Ballpark in Arlington (finish line was near home plate as everyone ran down the third base line from the outfield), a rodeo arena located in the middle of nowhere in Oklahoma and various other parks in Oklahoma, Texas and Louisiana. Unluckily for me, for the second year in a row, kicking off a new job has robbed me of the opportunity to commune with my MVC brethren at training camp. At least this year a little early-season competition would help take some of the sting out of missing out. Each year the multisport racing season in this region kicks off with the Frost Yer Fanny duathlon. The venue this year centered around Williamson County Regional Park, located in the Leander/Cedar Park area. The format for this race involved two run and one bike leg. The runs were both 5k (3.1mi) with a 21-mile bike leg in between. The temperature at the start of the race hovered around a balmy 38 degrees with overcast skies. The one saving grace, and an oddity for recent weather, was that there was only the slightest breeze. One of the biggest challenges of these cold-weather races is deciding what level of clothing to go with. Cold-weather cycling usually dicates one clothing setup whereas cold-weather running commands something completely different. Combine the two along with the fact that you have to change shoes a couple of times and the choice becomes increasingly difficult. Do I layer heavy and burn up on the run? Do I layer light and freeze on the bike? I chose to go with a maximum of two layers at any point on my body and it worked out well. If the wind had been blowing any harder, my choices would have been drastically different. Besides, who would want to sacrifice the silky aerodynamic smoothness of a skinsuit by putting on an additional layer over it? On the first run leg, the Garmin Forerunner is always a lifesaver. I was aiming for a conservative 8min/mi pace (not much of a runner) as to not blow up on the first leg of the race but found myself at a 6min/mi pace right out of the gate. I continually monitored my GPS-based pace and slowed until I was at my target while letting many, many people pass me. Always a hard thing to do, but being able to instantly monitor pace has saved me in multiple races. With the full race lasting in excess of an hour and a half, there is also the issue of nutrition to take into consideration. The combination of both running and cycling again introduces difficulties in one's plan.Taking on too much fluid or food before either run leg can cause multiple stomach and muscle difficulties but taking in a race worth of nutrition while in time trial position on a bike can also be difficult. I usually choose to take in quite a bit during the run to bike transition, take in fluid and other small bits of nutrition intermittently during the bike leg, and then take on one more gel shot during the bike to run transition. Works well for me but everybody is different (I particularly like Jeff Steinman's TT fluid system. Note to self: copy that.). One benefit of the multisport world is that it is easy to measure progress from race to race as everything is speed/pace based. This is in contrast to cycling-only races which are much more dynamic and one isn't always focused on individual results but, rather, contributing to the team goal. 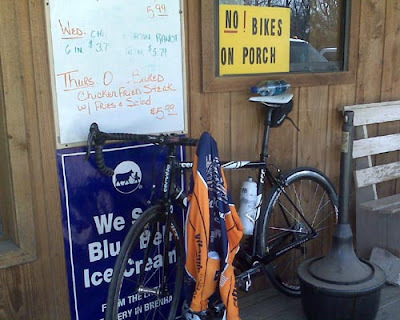 For the cyclist, the multisport world always offers a change of pace and a chance for some cross-training in the off season. This is something that makes McKinney Velo great. It isn't just about road cycling. We are also a diverse group of athletes. Along with the roadies, trackies, mountain bikers and cross riders, we are also runners, multisporters and casual enthusiasts. 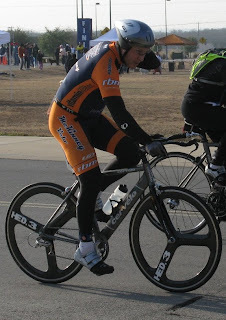 [Applause, Applause, Applause] Congratulations to Mike "Pantani" Adams for his 5th place yesterday in the 40+ at CC! Your double secret probation is officially lifted and your officially on the MVC team now.